Below, we can see the same data plotted as monthly payments instead of totals. If the past is any indication of the future--and I believe it is in this case--I expect the lines to once again converge over the next couple of years. 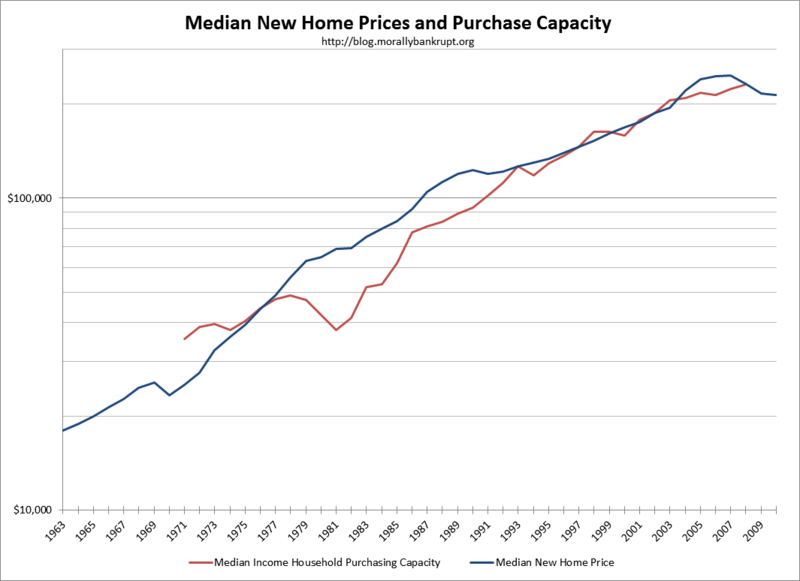 A return to the mean would require either real-estate appreciation, wage declines, interest-rate increases, or a combination of two or more of these variables. 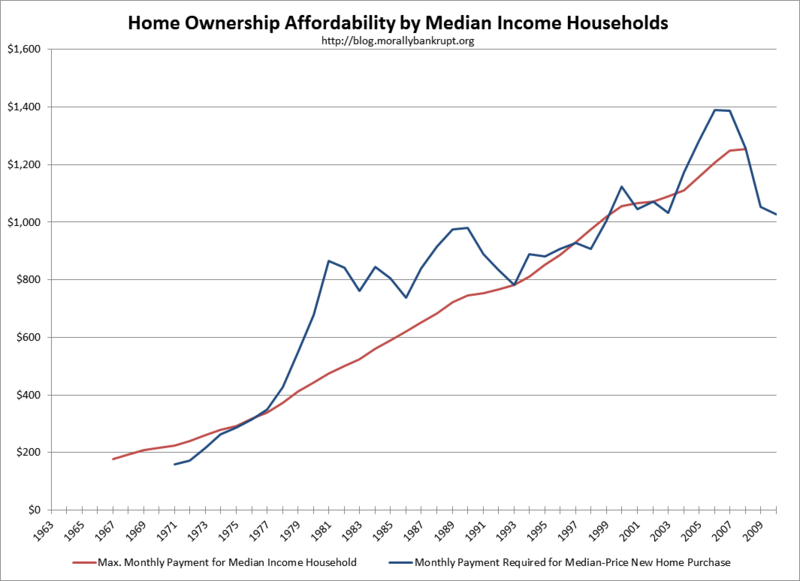 Does this mean that housing is cheap? 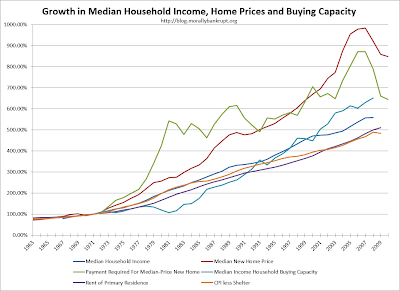 Measure in comparison to median incomes, yes, but that doesn't mean it isn't going to get cheaper. Another danger is future income-levels falling. 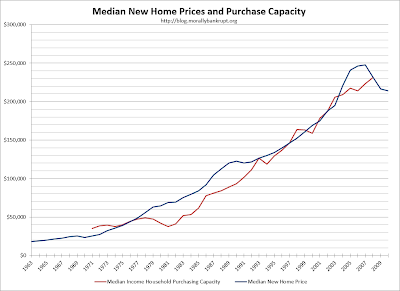 I expect housing to have negative inflation-adjusted price gains for a couple of years as sales volume declines, increasing the time it takes to reduce excess inventory, both in existing and new homes. 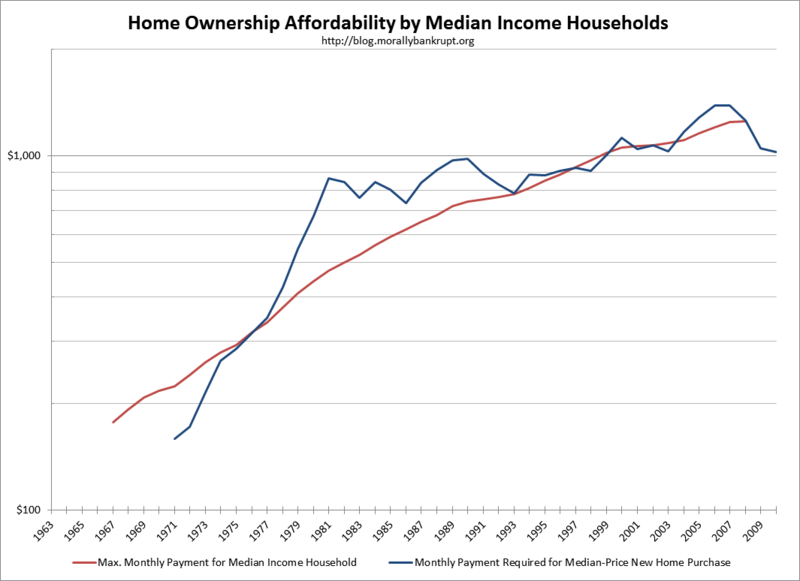 In addition, the recent decline in the home-ownership rate has probably left some people soured to the experience of owning a home or has damaged their credit-score or balance sheets. I don't think so. I wouldn't rush out there in euphoria, but it's probably a good time to buy if you have job security and can qualify for a good rate on a property you like and are willing to live in. Like I said before, I would not be surprised if I saw prices slide downward a little more, but I would be surprised if it was a big slide. It all depends on what price bracket you are looking to buy and the price-to-rent ratios in the areas that are of interest to you. The mortgage-interest tax break and equity build up might be large enough for you to be able to absorb a small loss in value and still end-up ahead. 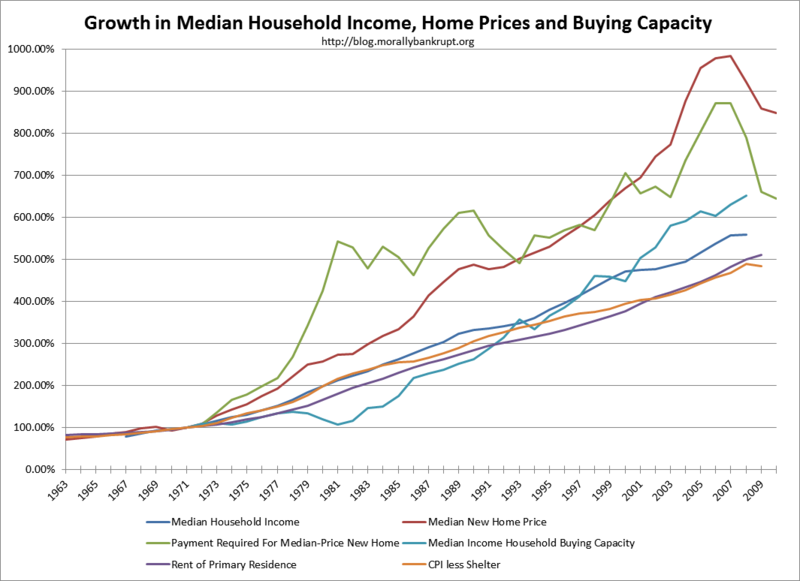 In the future, I hope to do some case studies on individual areas (probably a few from the Case-Shiller Composite). I don't have a crystal ball. 30-year rates are at record lows, but that doesn't mean they aren't going to keep going down if we find ourselves in a deflationary environment as a result of a balance-sheet recession. People in the inflation camp are getting ready for rapidly increasing prices, but with excess production capacity, elevated cash reserves in banks, and depressed employment, I think we have a couple of years before we start seeing any real inflation. This could mean lower rates and lower prices, but like I said, I don't have a crystal ball. Finally, I believe that Bernanke will take his sweet time tightening. Increasing interest rates when Americans are collectively servicing $830B of revolving debt at 14% seems like something politicians are going resist. Increasing rates would also put downward pressure on the fixed-income instruments that americans have been moving to en-masse to over the last two years. Well, if it's a good price to buy, why aren't more people buying and driving up prices? Because they can't. Many people lost jobs, savings and homes as a result of the recession. 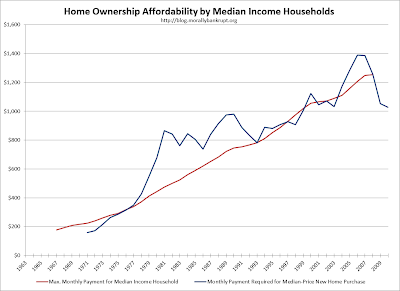 Many more (almost 70% at one point) already owned a home. 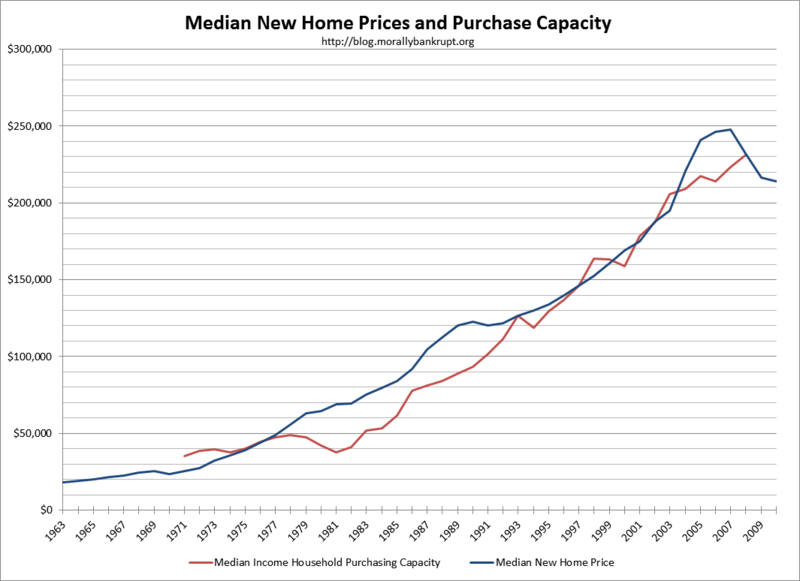 It is a real tragedy that, at a time when rates are at their historic lowest and prices have dropped so much from the peaks, the American consumer is in such a poor position to take advantage of these conditions, although of course this situation would have never presented itself if it wasn't for the crisis. 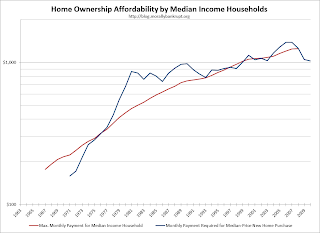 This event will be a lost opportunity for consumers that were over-leveraged prior to the recession, but is allowing many savers and younger workers to finally purchase a home, and for those with sufficient liquid assets to trade-up, even if it means stomaching realizing losses, because lower interest-rates allow more borrowing capacity. Finally, just for giggles, I add a chart with six of the previously used indicators, so you can see it all in one place. This is the final data post for the series. The next and last post will be a discussion about the underlying data, collection methods and possibilities for improvement. I will also include a link for readers to download the source spreadsheet with all the data so other people can benefit from the busy work of translating data series in PDF to a useable spreadsheet format. Tronng văn phòng công ty với mỗi phòng ban đều có những chức năng công việc khác nhau cho nên việc lựa chọn mua bàn làm việc văn phòng giá rẻ cũng hòa toàn khác nhau tùy vào mục đích sử dụng của văn phòng. Cho nên việc lựa chọn mua sản phẩm nội thất văn phòng như bàn, ghế, tủ… đều phải có sự thống nhất và dựa vào không gian văn phòng làm việc mà lựa chọn được mẫu sản phẩm cho phù hợp nhất. Hiện nay trên thị trường nội thất có rất nhiều sản phẩm bàn văn phòng hcm khác nhau nhiều giá, mẫu mã và chức năng. Bàn làm việc văn phòng cho nhân viên thì phụ thuộc vào diện tích khá nhiều. Những chiếc bàn làm việc đơn có hộc sẽ được sử dụng cho những căn phòng rộng để giúp mỗi người có một khoảng làm việc riêng và cũng để văn phòng không bị trống trải. Tuy nhiên, ở những thiết kế nội thất văn phòng hiện đại đề cao tính gắn kết nên lại chọn những kiểu bàn làm việc văn phòng giá rẻlớn dạng đôi để tập trung từng nhóm nhân viên lại với nhau. Vách ngăn vẫn sẽ giúp mỗi người có những khoảng không gian riêng cho mình. Cho nên để có một văn phòng đẹp hiện đại các nhà quản lý cần phải chọn mua được sản phẩm nội thất văn phòng hồ chí minh sao cho hài hòa với văn phòng cũng như là không gian làm việc tốt nhất. Chính vì thế các nhà thầu thiết kế cũng nên cân nhắc về việc tư vấn cho khách hàng của mình chọn được mẫu sản phẩm nội thất sử dụng tốt nhất. Bankrupt is a most important part of any economic crisis, it is the plumbing of economics, more countries have bankruptcy laws of essay writers australia, bankrupt is about death of a business, all the people lose money and jobs, many people suffer in case of bankrupt.